Royal Ascot is about so much more than just the horse racing. Charter a private helicopter to Royal Ascot this year and experience the style, elegance and pageantry of the most anticipated horse racing meeting of the calendar. The meeting dates back over 300 years to when Queen Anne first saw the potential for a racecourse at Ascot in 1711. Every year the Queen and other senior members of the Royal Family attend the meeting, arriving each day in a horse drawn carriage from Windsor Castle. Whatever the size of your party, and whatever your location, Bespoke Air Charter have the experience and expertise to find you the best value helicopter for the occasion. 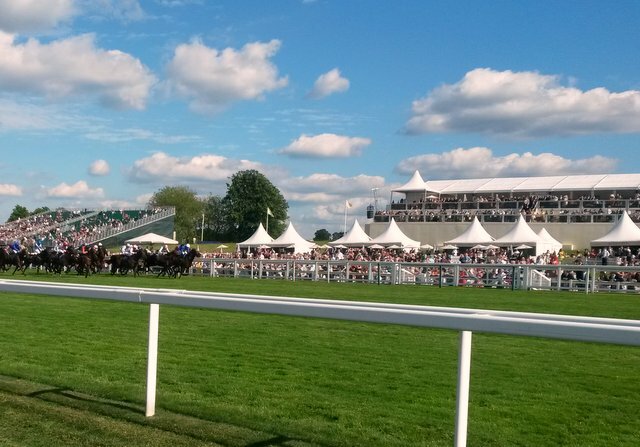 Ascot racecourse is only 15 minutes by helicopter from central London, with flights departing from Battersea heliport. Flights are also available from local airfields, hotels, or even your back garden if it is big enough. Once on board your helicopter you will enjoy complimentary champagne and an easy trip into the racecourse. And at the end of the day, avoid the queues and the traffic and enjoy a quick, comfortable trip back home. The meeting at Royal Ascot is a highlight of the British social calendar and attended by over 300,000 people during the course of the week. The five days of the meeting comprise the most glamorous event in London’s sporting calendar and as much attention is paid to the fashion of the race goers as to the racing itself. The highlight of the week, for both racers and race-goers is Thursday. The fashion and millinery on show reaches new heights for Ladies Day and the feature race is the Gold Cup, a long distance battle of stamina for both horse and jockey and not for the faint-hearted.